I'm a PhD candidate at the University of Colorado Denver, School of Public Affairs. My primary area of research is policy feedback and the formative effects of government in collaborative resource management policy settings. 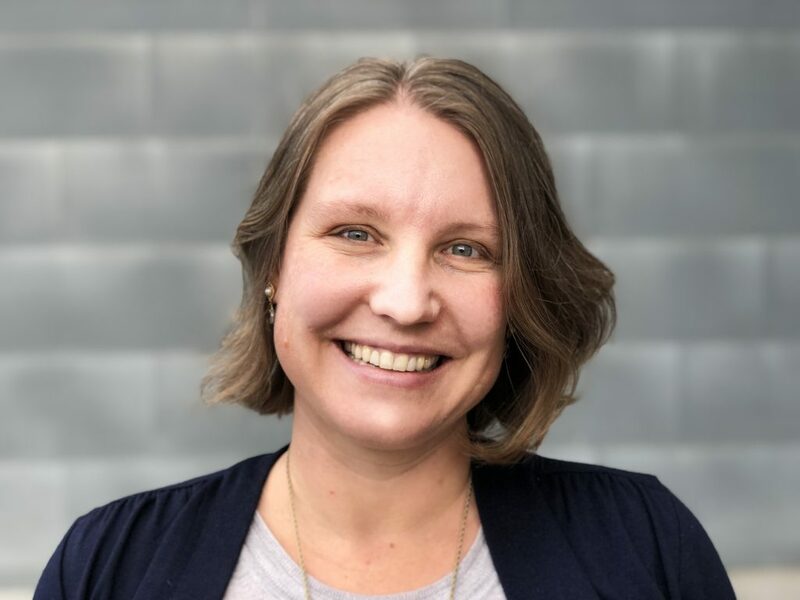 My experience as an executive director of a conservation nonprofit informs my teaching in organizational management and behavior and nonprofit management graduate courses. This post is about my search for a qualitative data analysis (QDA) software solution for writing literature reviews. 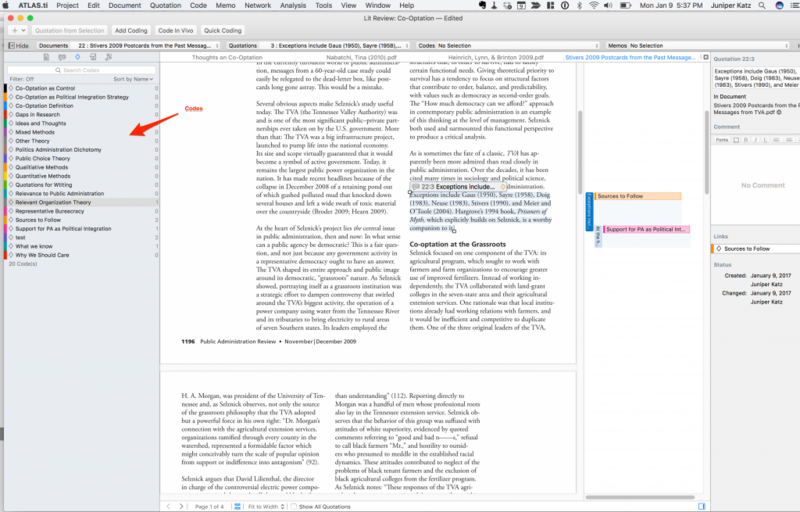 I review ATLAS.ti 8 and NVivo for Mac. One of the challenges of writing a dissertation is compiling, organizing, and synthesizing sources. Reference managers such as Mendeley and EndNote are great for inserting bibliographic information into text documents or grouping sources by chosen tags, but they are not great for coding and analyzing connections between documents or keeping track of ideas and thoughts. Note-taking software such as Evernote is great for taking notes from classes or articles, clipping webpages, and organizing thoughts, but again, there is limited functionality for drawing connections between bodies of literature or visualizing connections. Hence the need for a software capable of organizing, coding, and connecting concepts, ideas, and themes. 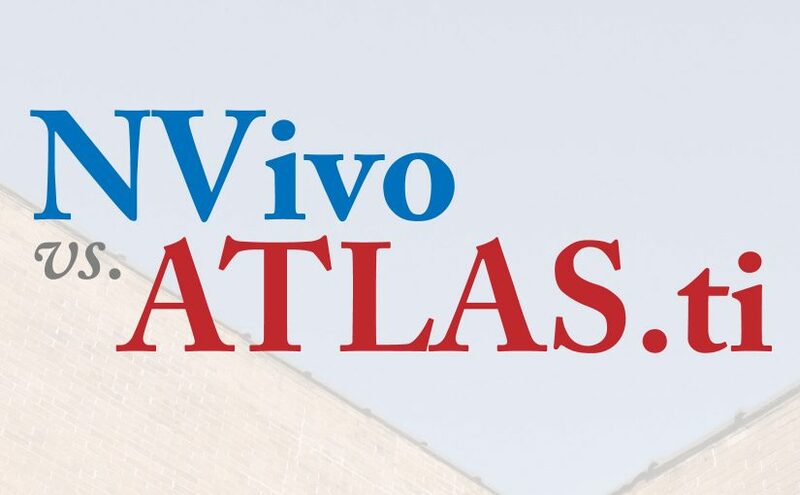 Both NVivo and ATLAS.ti are designed for executing qualitative (text based) research. To be fair, neither program is specifically designed for writing literature reviews, however, literature reviews are essentially qualitative data analysis. This review is specific to the Mac versions of the two softwares which have slightly different functionality than the Windows versions. Below are short bulleted lists of the pros and cons of each program. I ended up choosing ATLAS.ti because PDF rendering issues in NVivo were bad enough to be prohibitive of its use. I also have a feeling that knowing how to use ATLAS.ti will serve me in the future when I conduct qualitative research projects outside of literature reviews. However, had the rendering not been a problem, NVivo is easier and more effective for the purpose of conducting lit reviews. One additional suggestion that may make coding texts easier is to get a subscription to Adobe Acrobat Pro (they have special student pricing too) and use the enhance PDF tool to OCR every PDF you plan on importing into ATLAS.ti or any other QDA program. This process help with text recognition when you are selecting and coding text. 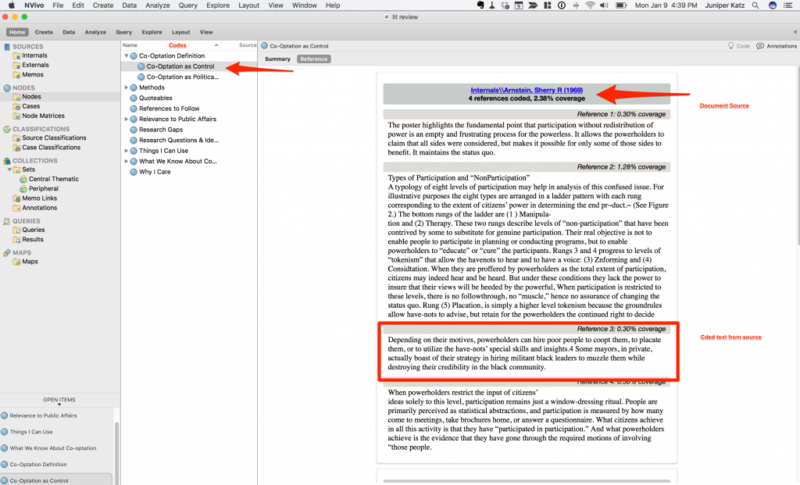 Example of a list of coded text from one document in NVivo. Click image for full-size. Article coding in ATLAS.ti. Click image for full-size. Neither tool is perfect: NVivo has performance issues, but good functionality for the purposes of a lit review. Maybe in the future, once they solve these issues, it will be a clear winner. For now, the bugs cripple the application beyond usability for me. I’m in the early stages of getting to know ATLAS.ti and will post an update when I have new information to share.